The Grammys May Not Be Hip, But For These Nominees, The Awards Still Matter In a year when the likes of Frank Ocean and Justin Bieber have dismissed the awards show as irrelevant, Mandalit del Barco speaks to a few artists for whom a Grammy win remains a very big deal. 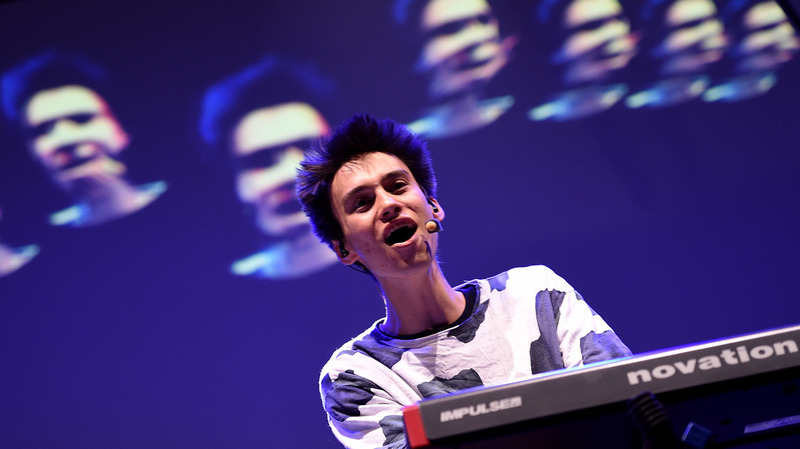 Jacob Collier performs at Italy's Locus Festival in July 2016. The 22-year-old musician and arranger, up for two Grammy awards this year, started his career as a YouTube sensation. This year, "music's biggest night" will be missing more than a few of its biggest stars. Despite multiple nominations, Kanye West, Drake and Justin Bieber are reportedly skipping tomorrow evening's Grammy Awards. Bieber has called the show "irrelevant." Frank Ocean didn't even bother to submit his acclaimed album Blonde for eligibility; he told The New York Times the Grammys don't represent people like him. Newcomer Kelsea Ballerini, however, says she's excited to be up for Best New Artist, alongside Chance The Rapper, The Chainsmokers, Anderson .Paak and another country star, Maren Morris. "Just the fact that me and Maren are both in that category, I think, is really cool," she says. "I definitely know that Nashville feels like it's a big win regardless of who actually gets the award." Ballerini co-wrote the chart-topping song "Peter Pan," which she performed at the Country Music Association Awards. She'll be performing at the Grammys for the first time. "I feel like my peers tipped their hat to me. And that really makes me feel validated as an artist," Ballerini says. "It makes me feel like a cool kid." Another country artist, Lori McKenna, has four Grammy nominations this year, including one for "Humble and Kind," a song she wrote that became a hit for Tim McGraw. McKenna won for Best Country Song last year, and says that win was a game-changer for her career. "It lets you make your own path a little bit more. It lets you scale back if you need to, or make something bigger if you need to," she says. "It allows you to streamline your career a little bit so you can be more creative if you need to, or be with your family more if you need to." McKenna says she's elated that from now on, she'll be known as a Grammy winner. She and others hope that honor leads to more records, more money, more gigs, more fans. "It's also very important for people working with you," says French composer, performer and record producer Jean-Michel Jarre. "These days, artists are surrounded by managers, by labels and people giving lots of energy and time and hope and love into what you do." Jarre has composed film scores, and helped pioneer electronic music in the 1970s. But he's never won a Grammy. This year he's up for Best Dance/ Electronic Album. "Electronic music was born in Europe and then invaded the world," Jarre says. "So it shows that when the Grammys are recognizing somebody in the electronic music field, it's actually not only for the U.S. market, but really for the international audience. So it is important, obviously." Winning a Latin Grammy four years ago made Gaby Moreno a star throughout Latin America, especially in her native Guatemala. This year, Moreno's fifth album, Illusion, is nominated for Best Latin Pop Album at the mainstream Grammys. "The Grammys means the general market to me. And so, I dunno, for me it's a bigger deal, 'cause you're there with the really big names in the music industry — you know, like Adele and Beyoncé," Moreno says. "It opens doors for a lot more opportunities, and for myself personally, it just motivates me. " Moreno's album was produced by Gabriel Roth, who was also bandleader, bass player, songwriter and producer for Sharon Jones & the Dap Kings. They were nominated for a Grammy in 2014, and Roth says winning would have meant a great deal for his band's late singer. "I think for Sharon it was tied into a bigger goal of hers, which was basically to kind of reclaim soul music, reclaim R&B," Roth says. Roth, himself himself a two-time winner for producing Amy Winehouse and Booker T. Jones, is less invested in the Grammys. "It's a baloney award, man," he says. "Everybody in the industry votes for the record they worked on, or the record their friend worked on, or the record that they got an email that their friend said that you gotta vote for this record. You know, they're not good records that are winning Grammys. It's like a high-school popularity contest." But jazz pianist and bandleader John Beasley says the Grammys mean more than just the televised awards: The organization's foundation takes music to schools and helps struggling musicians. Beasley leads a 15-piece big band called MONK'estra, whose tribute album to Thelonious Monk is nominated in one of the jazz categories. "This year is Thelonious Monk's centennial, so we're hoping it creates more awareness for Monk's music," says Beasley. "He was underappreciated during his time. A lot of the music was composed 80 years ago, and it still sounds fresh. This music is still living and breathing right now." Beasley is also competing in one of the arrangement categories with 22-year-old Jacob Collier, who's up for two awards. As in his version of The Flintstones' theme song, Collier sings all the vocals and plays the instruments himself. The one-man band started out as a YouTube sensation. "I hope that the Grammys will instill a sense a sense of faith in people who want to do things their own way and are wondering if that's a valid way of doing things," he says. Collier is also rooting for his friend Chance the Rapper, whose mixtape Coloring Book is nominated for Best Rap Album. Chance's record was commercially released only as an online stream — meaning that if he wins, it'll be Grammy history.